Our Aged Whole Bone In Country Hams are dry cured and hickory smoked: incorporating time, patience, and the traditional family recipe to produce a delicious product. These hams are aged 12-14 months, giving them a much more complex and intense flavor that many of our customers prefer when enjoying them as charcuterie; similar to how folks enjoy an Italian prosciutto ham or Spanish serrano ham. 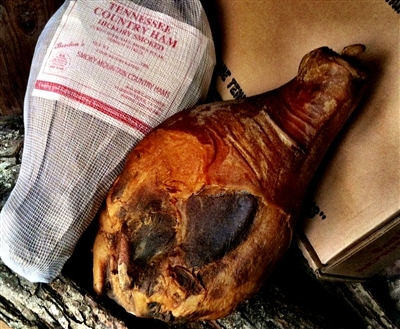 With an average weight of 15-17 lbs, whole hams are packaged in brown paper and a cotton sack and make excellent gifts for any country ham connoisseur.